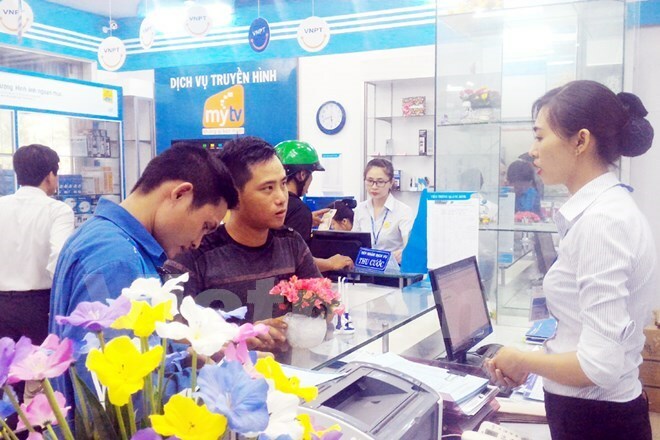 Hanoi (VNA) – The Vietnam Post and Telecommunications Group (VNPT) earned an estimated 63.15 trillion VND (2.8 billion USD) in revenue and 2.16 trillion VND in profit in the first half of this year, achieving 50.6 percent of the yearly target. The revenue also registered a 121.1 percent year-on-year increase. In a press release issued on July 18, VNPT said mobile network operator VNPT-VinaPhone, one of the firm's key arms, maintained a good growth rate by adding 6.5 million subscribers in these six months. The network operator is estimated to have earned 25.4 trillion VND in the first half of this year, making a profit of 569 billion VND, equal to 51.76 percent of the yearly target. Meanwhile, VNPT-Media, established last year, earned more than 532 billion VND in revenue and 53 billion VND in profit. Speaking to local media on the occasion of the 20th anniversary of the establishment and development of VNPT last month, Deputy Director Luong Manh Hoang said the firm aimed to claim 33 percent of the market share, being the second largest service provider in the Vietnamese telecommunication market this year. Vinaphone said it currently had nearly 20 percent of the market share and was the third largest service provider in the market. The top two network providers are Mobifone and Viettel. Hoang said VinaPhone had invested heavily in infrastructure to supply wide bandwidth for 4G services to meet the customers' demand. "When the 4G service is licensed, it will be a good opportunity for us to change our ranking and shorten the gap with the number one rival in the market," Hoang said.